This section deals with the more recently founded UK bone china manufacturers, opened for business during the mid to latter part of the 20th century. 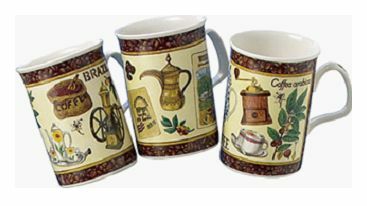 Founded only in 1973 in Staffordshire, England, you could say Caverswall is a definitely a new kid on the block compared with the antique bone china makers. The people at Caverswall obviously saw an opportunity that the big old manufacturers had missed. Had they been wrong, the company wouldn’t still be around 35 years later. So where was their niche? They positioned themselves firmly at the top-end and their stockists include Asprey and Fortnum and Mason. Their client profile boasts old money and nouveau-poshdosh alike (footballers wives). These clients often enjoy taking advantage of the bespoke service. The bottom line for this firm is they take a stand against the tide of disappearing production values. They set their stall out on the skills and techniques of a bygone age – and I like that very much in the face of so much modern day executive flakiness. It is important to remember that many of the big old names are just that – names only, no longer makers. The old firms have been (sometimes brutally) swallowed up by the big guns, becoming just backstamps to fiddle about with at the whim of incumbent executives. Caverswall is no mere brand name - its a proper Staffordshire company with beautiful production values. Long may they reign. Unlike many of the bone china manufacturers featured on these pages, there is very little Caverswall ever on sale in online auctions (apart from their trinket commemorative items). The top end luxury 'heirloom' nature of their new prices on tableware probably mean there is virtually none on the secondary market. Added to that, they are not a mass producer and have a relatively short history, so there just isn't much Caverwall around in comparison to other bone china manufacturers who have a couple of centuries of production knocking around the secondary market. Although founded in 1878 (Staffordshire, England by Simon Fielding) Crown Devon were not, originally, bone china manufacturers. Fielding, a mill owner, manufactured majolica, green-glaze wares, toilet wares and fancies. 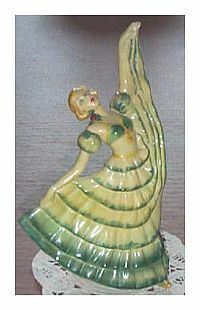 In the 1930’s their figurines were made of earthenware, with a cellulose point or under glaze finish. The company traded until the 1970s when the recession and cheaper overseas competition finally saw its demise in 1982. Unlike the well documented connections of Crown Derby (see antique bone china section listed under 'R' for Royal Crown Derby), I can’t find any references to royal patronage that would authenticate the use of the ‘Crown’ trade name. Today, a company called Crown Figurines has come up with the very clever idea of reprising the art deco figurine ranges of Crown Devon. Using the original molds, the new product is far superior because being re-created in fine bone china. Bone china allows colors to be added ‘on glaze’, extending the range of finishes and colors. It was a shame to have the characteristically high quality artwork of the deco period spoiled by the use of inferior materials. Crown Figurines have shown great enterprise and imagination in adding value to an already collectible range. I wish them great fortune and hope they do well. 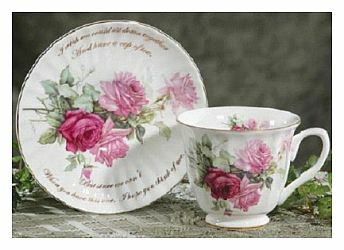 see the Dunoon Bone China page. Founded 1983 by Bob and Pauline Walpole, this company is one of the best modern UK bone china manufacturers. To me they are the epitome of all that is good about Stoke-on-Trent bone china manufacturing in particular, and the UK China Industry in general. Now run by Bob and Pauline's sons, Peter and Michael, they are part of the very living fabric and history of the famous 6 towns. If any awards are going to UK small businesses, they would be first on my list. As well as promoting their own Pollyanna Bone China brand, the Walpole brothers are the specialist team behind the big firms of Doulton, Royal Worcester, Wedgwood and Coalport - overseeing the production of their most prestigious bone china figurine and tableware collections. Their Hanley plant, in the heart of the Staffordshire Potteries produces bone china of the very highest quality. Always modest about their achievements, the Walpole brothers concentrate on supplying top quality product and let others get the acclaim. 'The Present Company' and 'The Royal Collection' are other brands which benefit from their expertise. Surviving and growing through terrible times in recent years, especially for the Staffordshire Potteries, good management and serious application has brought this firm to the fore in terms of quality UK manufacturing. Younger brother, Michael is a technical boffin who, when asked how he gained all this knowledge, humbly says "It's all common sense really - when you've been in the thick of it since you were 16, you just pick it up". Older brother Peter is the business brain - one of those gifted folk able to see the 'big picture'. In the same way as countless of the founding characters I write about in the Antique China Manufacturers A to Z Guide, he has the passion and the driving force to push the business forward no matter what. The recent closure of UK plants like Spode was a major boost to their resources when they were quick to buy several pieces of state-of-the-art Spode machinery for a snip. I take great pleasure in visiting this prestige Staffordshire bone china maker and it is a privilege to see my own Coalport, Doulton and Worcester figurines being made in their pot bank which blends the oldest 'hand-crafted' traditions with the newest of 21st Century technologies - and want to thank them for doing such a good and careful job. Founded 1951 in Valencia, CA, USA by Herman Dodge, I haven’t come across any warrant which would justify use of the word ‘Royal’ with the Patrician trade name. That said I like the energy and philosophy of this company. A division of US wholesalers and importers Herman Dodge Inc, Royal Patrician has cleverly positioned itself in the same anglophile niche as prestige British icons like Rolls Royce, bench-made English period furniture and afternoon tea at the Ritz. 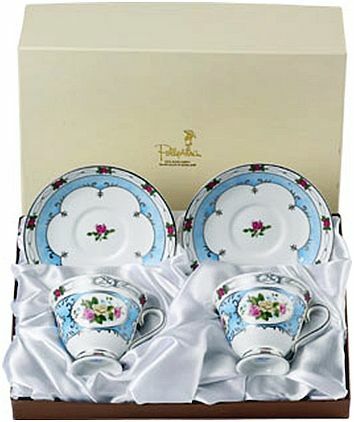 One of the genuine English fine bone china manufacturers, made in Stoke-on Trent, Staffordshire at the heart of the English Potteries with values that take you back to a bygone era, Royal Patrician is to be congratulated - a genuine bone china manufacturer with an excellent brand. Founded around 1975 in Staffordshire, England by Roy Kirkham, the company is still a family owned and run business. Kirkham only has eyes for the finest English bone china. Founding her own pottery in 1929 after only 7 short years in the industry, Susie Cooper’s visionary drive was unstoppable, even with the overpowering current of sexism flowing against her. 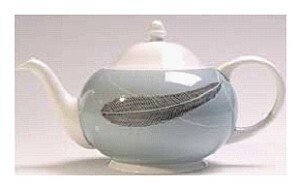 Initially she didn't make bone china wares - not until the 1950's. Eventually she merged with Tuscan and concentrated solely on fine bone china. As early as the 1930's Susie Cooper won royal approval. The Duchess of York chose Cooper wares in 1933. In the 1950’s The Royal Society of Arts chose her to design for its own china range, as well as their own 'Royal Designers for Industry' plate to celebrate their Bicentenary. Truly highly thought of, her designs were chosen for the Royal Pavilion at the Festival of Britain in 1951. 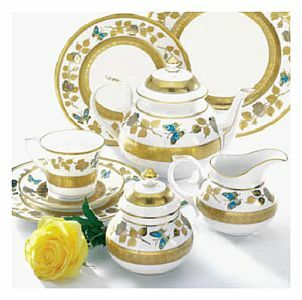 Originally buying in white-ware to decorate and sell on, she moved into the manufacture of bone china in 1950. At that time her patterns were reproduced in both bone china and earthenware. Later, after 1964, she worked almost exclusively in fine bone china having joined forces with Tuscan ware otherwise known as RH & SL Plant Ltd - 'metallised' bone china ware (see Tuscan Tableware) who had excess capacity. After 1967 both Cooper and Tuscan were bought out by The Wedgwood Group.